January 2016 | I Style Me Girl! 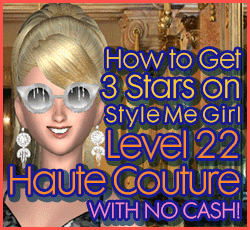 How to Pass Style Me Girl Level 25, "Floral," & Get 3 Stars With NO CASH ITEMS! "Floral," is the theme of Style Me Girl Level 25 and features the model Sarah. I earned a "Stunning," three stars for the "pretty poppy," look I gave to model Sarah, and as always, I did it without spending any cash! Nope, all items used in this example are either free (come with the game) or silver coin items from the Style Me Girl Boutique. 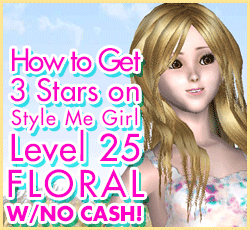 Keep reading to find out how to pass Style Me Girl Level 25, "Floral," without any cash items! 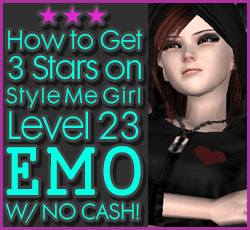 How to Get 3 Stars on Style Me Girl Level 23, "Emo," With No Cash Items! Kimberly goes "Emo-nesian," in Style Me Girl level 23, where the theme is "Emo." I gave her what I consider a quintessential "emo," look, complete with black fringe hair over her face, skinny jeans and black. Apparently Style Me Girl agrees, I got three stars for the level. 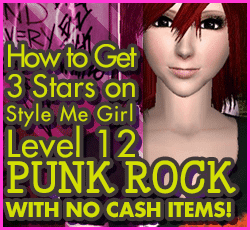 Find out how to pass and get three stars on Style Me Girl Level 23, "Emo," theme in the post! 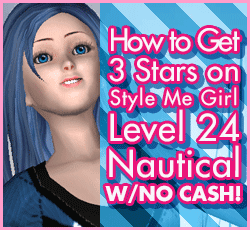 How to Get 3 Stars on Style Me Girl Level 20, "Dream" Fashion Angel - WITH NO CASH ITEMS! "Dream," is the theme of Style Me Girl Level 20, featuring model Fashion Angel. I came up with a look that passed the level earning a "Stunning," three stars without using any cash items. Continue reading to see how I got thee stars on Style Me Gilr Level 20, "Dream." 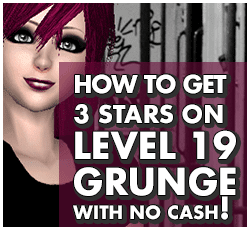 How to Get 3 Stars on Style Me Girl Level 19 Grunge with NO CASH ITEMS! Style Me Girl updated since my first post on Level 19, Grunge. In the updated game, some of the items I had used, namely the hair, are no longer available. I had to find another way to get three stars using no cash items! To find out how I earned three stars on Style Me Girl Level 19, Grunge, without any cash items read the full post! 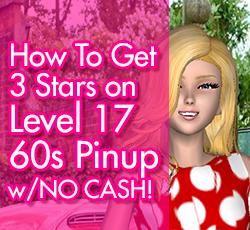 How to Get 3 Stars on 60's Pinup, Style Me Girl Level 17 without cash items! Style Me Girl Level 17, "60's Pinup," required some unusual styling and was not an easy one for me to solve in the past. Animal costume parts ended up being used in my first three star example, and initially, every time I used blonde hair it said to use black, but when I used black it said to use blonde! But alas, a much more sensible and also economical method, requiring NO CASH ITEMS, has been discovered which I am sharing with you in this post! How to Pass Style Me Girl Level 16, "Princess," & Get 3 Stars For 100% FREE! 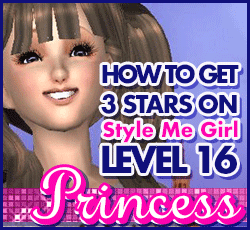 I am stoked to share this new 100% FREE method for passing Style Me Girl "Princess," Level 16 with three stars. My earlier examples also supply a three star result, but this example is not only free of cash items, it's 100% free! Everything used comes with the game! If you would like to get 3 stars on Style Me Girl Level 16, "Princess," for 100% FREE, keep reading! 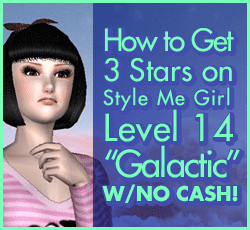 How to Get 3 Stars on "Galactic," Level 14, Style Me Girl Without Any Cash! Yet another Style Me Girl level that can be somewhat of a challenge is Level 14, the "Galactic," theme. After a few tries I was able to find a way to pass the level without using any cash items and earn three stars for my "Alien-chanting," look. To see how I styled model Madison in Style Me Girl Level 14, "Galactic," theme, continue to the full post! 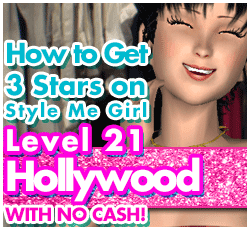 How to Pass Style Me Girl Level 13, "Mod," with 3 Stars & No Cash! 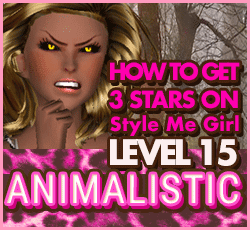 Style Me Girl Level 13, "Mod," theme can be a bit tricky but it's actually really simple once you use the right items. 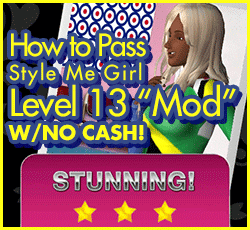 I passed Style Me Girl Level 13, "Mod," using only 4 items total, three of which come with the game! The one thing I bought for this level was only 38 coins, not a cash item! To see how I achieved getting three stars on Style Me Girl Level 13, "Mod," without using any cash items, continue reading the full post! 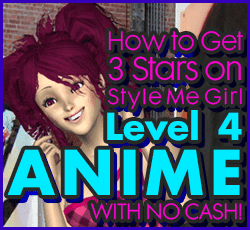 How to Pass Style Me Girl Level 11, "Hippie," & Get 3 Stars Without Cash Items! 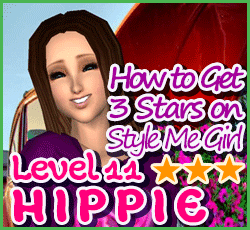 Style Me Girl Level 11, "Hippie," theme with model Sunshine, was another really simple and affordable level to pass & get three stars with. Since I already had the pair of sandals I used from an earlier level, I onyl had to buy the shirt and bell-bottoms, which together were only 53 coins. 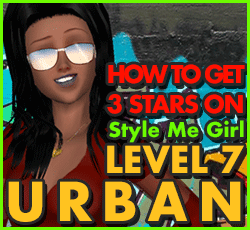 In this post I share how to pass Style Me Girl Level 11, "Hippie," theme & get three stars with no cash items. 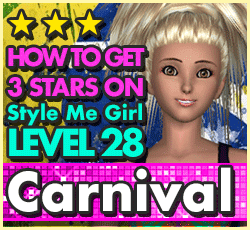 How to Pass Style Me Girl Level 9, "Beachwear," & Get 3 Stars With No Cash Items! Model Fara is a "Beach Baby," in Style Me Girl Level 9, a tropical island assignment where "Beachwear," is the theme. I created a three star earning "Stunning," look for Fara, using only two items, and they aren't cash items to boot! How to pass Style Me Girl Level 9, "Beachwear," with three stars and no cash items is detailed further in the full post! 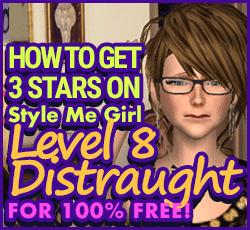 How to Pass Style Me Girl Level 8, "Distraught," & Get 3 Stars With Items Already In Closet! 100% FREE! Stella is "distraught" in Style me Girl Level 8 because her beloved puppy is missing, and that's the level's theme. Despite the sad premise, this level is one of the few which can be passed using items already in the Style Me Girl Closet making it super awesome! That's right, three stars can be achieved for this level using items already in the closet making this level 100% free! Details in the full post. How to Pass Style Me Girl Level 2, "Office," & Get 3 Stars for FREE! On Style Me Girl Level 2, "Office," with Victoria as the model, I earned a three star result using items already in the Style Me Girl Closet. At this early stage, I didn't see a need to buy items, so I saved my coin and put together an effective "free" style. In this post, I'll show you just how I passed Style Me Girl Level 2, "Office," for free.